Born: November 24, 1888 in Palmer Ma. 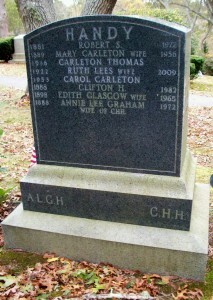 Died: May 6, 1972 in Bourne Ma. at 83 yrs, 4 mos, 12 d.
Married: June 14, 1919 in Bay City Mi. 1. Virginia Lee Handy Sheoytz; (June 1, 1920 – April 29, 1972); Married Levi Michael Sheotyz, WW ll (1913 – 1988) (Michael Peter Sheoytz & Olive Lincoln Hamblin) in Bourne Ma. on May 29, 1947; Virginia & her son Drew Clifton Sheotyz are buried in Cataumet Cemetery; Levi is buried in Massachusetts National Cemetery in Bourne Ma..
2. Dorothy Clifton Handy Phillips; (January 2, 1923 – April 4, 1996); Married Frederick Bourne Phillips, WW ll (1913 – 2001) (Alfred C. Phillips & Edna Clifton Bourne) in Muskogee Ok. on April 3, 1943; She died in Falmouth Ma. ; Dorothy & Frederick are buried in Cataumet Cemetery. 4. Philip Dustin Handy, Korea, Vietnam; (November 6, 1928 – June 14, 1995); Philip married Susan Jones (–) (1942 – ? ); He died in Charleston S.C.; Phillip & Susan are buried in Hillcrest Cemetery in Conway S.C..